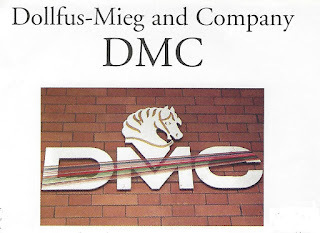 Familiar to every needle-worker are the initials DMC, which stands for Dollfus-Mieg and Company, manufacturers of fine threads and yarns. The company began as a fabric printing company run by Jean-Henri (1742-1802) and his brother Jean Dollfus (1729-1800), selling their hand-painted Indian cotton prints throughout Europe. They expanded and sold their fabrics internationally. In the late 1700’s Jean-Henri’s nephew, Daniel (1769-1818) ran the company and married Anne-Marie Mieg, adding her surname to the company’s logo. D.M.C. Jean Dollfus-Meig (1800- 1887) while studying at Leeds became acquainted with John Mercer’s process of thread manufacturing, “mercerization” Mercer, a calico printer and self-taught chemist, patented his process (1850) which changed the texture of cotton thread, strengthening it and giving it a silk-like luster. Jean Dollfus-Meig introduced this process in 1898 to the factory in Mulhouse, France. Since thread quality depends on the purity of the water used in its bleaching and dyeing, the properties of the water (Vorges River) in Mulhouse made this an ideal location for the factory. The story of the manufacturing of fine threads and yarns includes the meeting of Jean Dollfud-Meig and the famous embroiderer, Therese de Dillmont. When Jean encountered her work in an exhibition in Paris, he invited her to Mulhouse to tour his factory. She subsequently moved to Dornach , a nearby town and established school of needlework in close cooperation with DMC. Her famous “Encyclopediie des ouvrages des dames” (“Encyclopedia of Ladies Handicrafts) has been translated and distributed to more than seventeen countries. In 1961 DMC merged with Thiriez & Cartier Bresson, a French Textile firm of over 250 years. 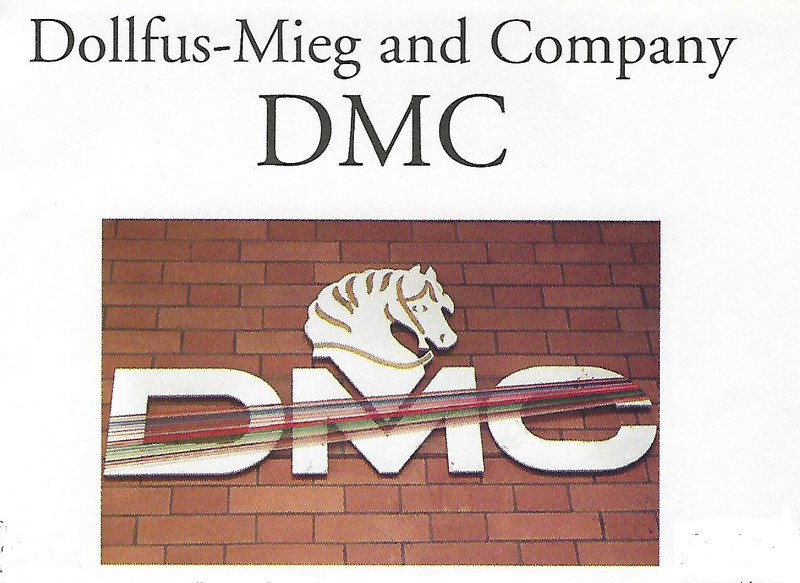 The company name remained DMC but the logo was changed , replacing the DMC bell with the now famous Thiriez’s horse head. 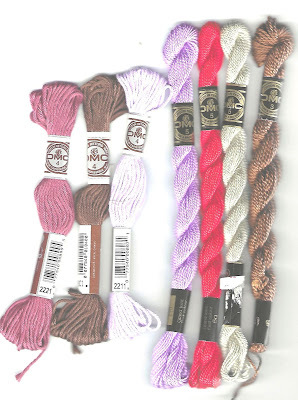 Manufactured threads include: Embroidery floss, six stranded cotton. *Twisted separable, shiny thread, suitable for surface stitchery, counted-, pulled-and drawn-thread work. Available in 454 colors. Pearl cotton. * Twisted, shiny thread, available in two thicknesses. Used for stranded cotton where you require a heavier effect. Tapestry wool. * Thicker, four ply wool. Use as for crewel work. 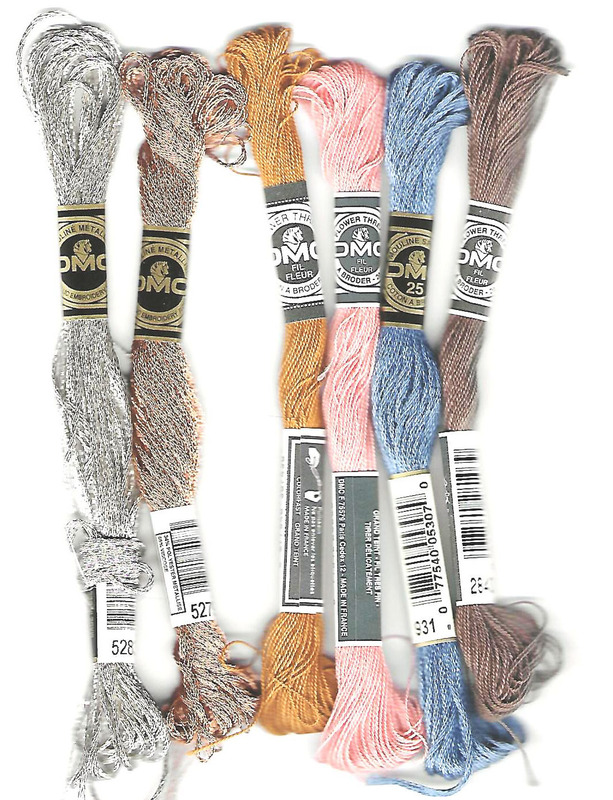 To celebrate the anniversary, DMC is producing The Golden Skein. 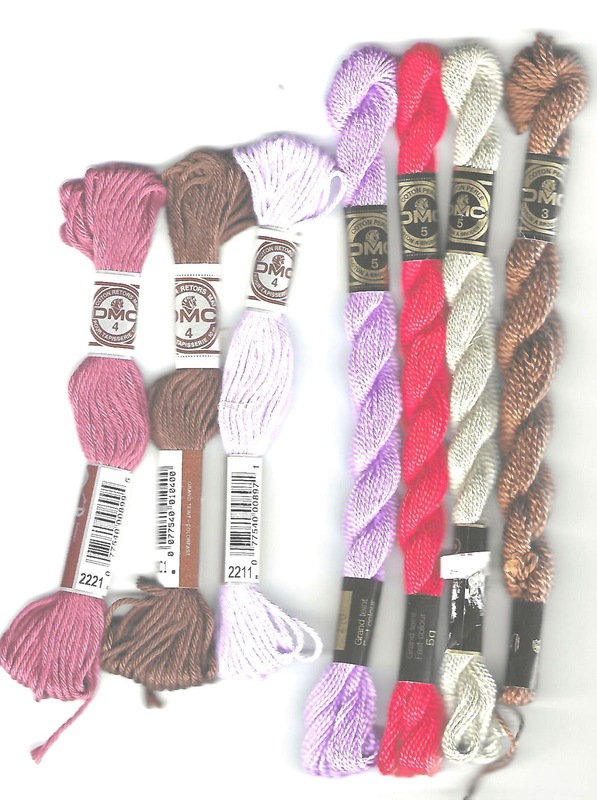 "a soft, flexiible six strand floss that incorporates a 24 karat gold wash. A beautiful collectible, the Golden Skein is a fitting symbol of DMC heritage and also the product esteemed by stitchers: DMC Embroidery Floss. 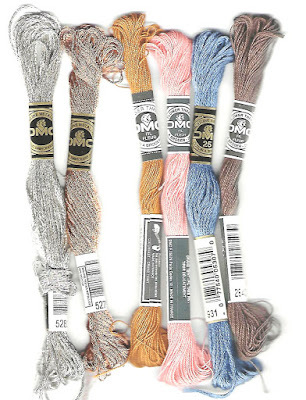 This precious skein can be preserved or carefully stitched to add incomparable richness to a treasured embroidery. It comes in a special deluxe box, with a bound book of DMC history and antique cross stitch charts."